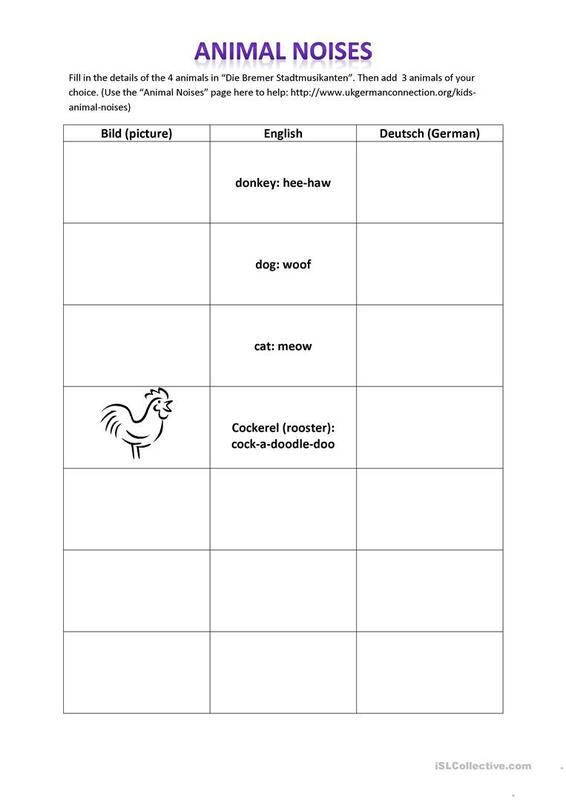 As part of a study of "Die Bremer STadtmusikanten", look at the way animal noises are written in German as compared to English. Fill in the table. The present printable, downloadable handout is intended for elementary school students at Elementary (A1) and Pre-intermediate (A2) level. It is excellent for developing your pupils' Listening, Reading and Writing skills. It features the theme of Animals. bronijb is from/lives in Australia and has been a member of iSLCollective since 2012-06-21 04:42:04. bronijb last logged in on 2012-07-16 05:07:38, and has shared 1 resources on iSLCollective so far.